Eating well is all about being prepared, which usually means making meals in advance. In order to cook more efficiently, you also need to be prepared. When chicken breasts were on sale at my Price Chopper for $1.99/lb., I bought a large package. Then, I boiled the chicken and shredded it, and put it in the freezer in 2 c. portions. I used one container for the Chicken Enchiladas I made a couple of weeks ago, and another for today’s casserole. It saved me a lot of time. I know that summer doesn’t generally equal ‘casserole’, but those of us who work in climate controlled environments often still like a hot lunch. I was inspired by Recipe Girls’s Chicken Spaghetti Casserole, which she had lightened up considerably. I lightened things just a little further, and this still turned out to be a rich, cheesy casserole. There is also a lot of it, which means I have no excuse for not bringing lunch this week. In a large pot of boiling water, cook the pasta al dente. Set aside. In a large frying pan, heat oil, and add onion. Cook for 15 minutes, until onion begins to get soft and browned. Add mushrooms and broccoli, and cook for 15-20 minutes more. Add soup and milk and stir until blended. Add chicken and stir. Add cheese and stir until melted in. Cook on Low for 5-10 minutes until heated through. Coat a 13″x9″ dish with cooking spray. Place pasta on bottom of dish, and then top with chicken/vegetables mixture. Stir to coat. Bake at 350F for 20-25 minutes, until bubbling. One of my favorite summer recipes is Zucchini and Black Bean Enchiladas. But zucchini isn’t quite in season yet, so I decided to try a different version. 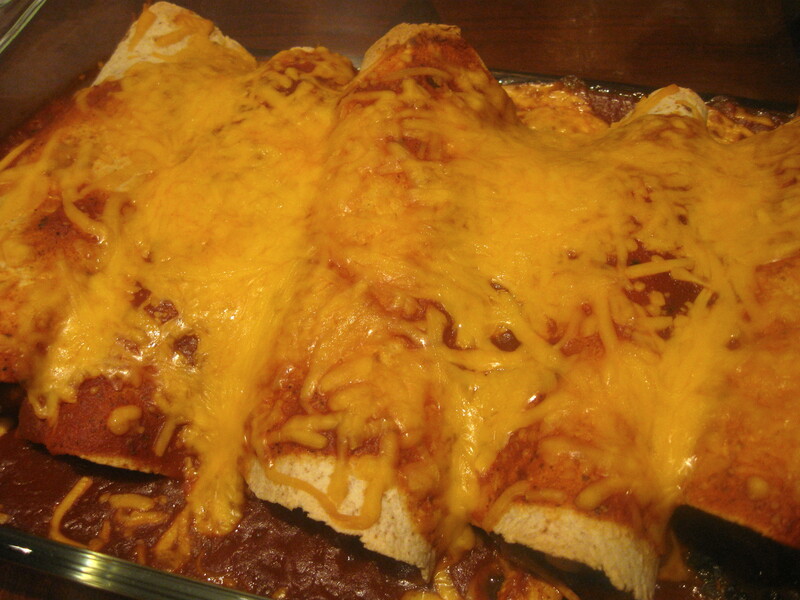 No matter what you stuff in the tortilla, I think the key to great enchiladas is homemade sauce. This time I used Penzey’s Chili 9000 seasoning to make the enchilada sauce. It is not too spicy, but does have a lot of flavor, with Ancho Chili Pepper, Cumin, Garlic, Cilantro, Onion, Paprika, Cayenne Pepper, Lemon Peel, Mexican Oregano, Black Pepper, Cocoa Powder, Citric Acid, Turmeric, Cinnamon, Coriander, Ginger, Natural Smoke Flavoring, Fenugreek, Cloves, Fennel, Nutmeg, White Pepper, Anise Seed, Jalapeño Pepper, Star Anise, and Cardamom. Don’t stress if you don’t have access to Penzey’s, just substitute a mix of chili powder and cumin and you’ll be all set. The enchiladas themselves were also delicious, and will make great packed lunches for the week. I still can’t wait to have the zucchini and black bean version again later this summer! To make the enchilada sauce, coat the bottom of a small saucepan with cooking spray. Add minced garlic. Cook just until beginning to brown, and then add tomato sauce, spice, and broth. Simmer for 15-20 minutes. Meanwhile, in a large frying pan, heat canola oil. Add onions and cook for 15-20 minutes on medium-low heat. Add chicken, spinach, and 1 c. of the prepared enchilada sauce. Simmer for 5 minutes, until heated through. Coat the bottom of a 13×9″ dish with cooking spray. Fill each tortilla with a heaping 1/2 c. of chicken mixture, and place seam side down in the dish. Pour remaining enchilada sauce over filled tortillas. Sprinkle cheddar cheese on top. Bake at 350F for 20-25 minutes. I promise, we’ll get to the chicken pot pie, but first I have to share a great customer service story. 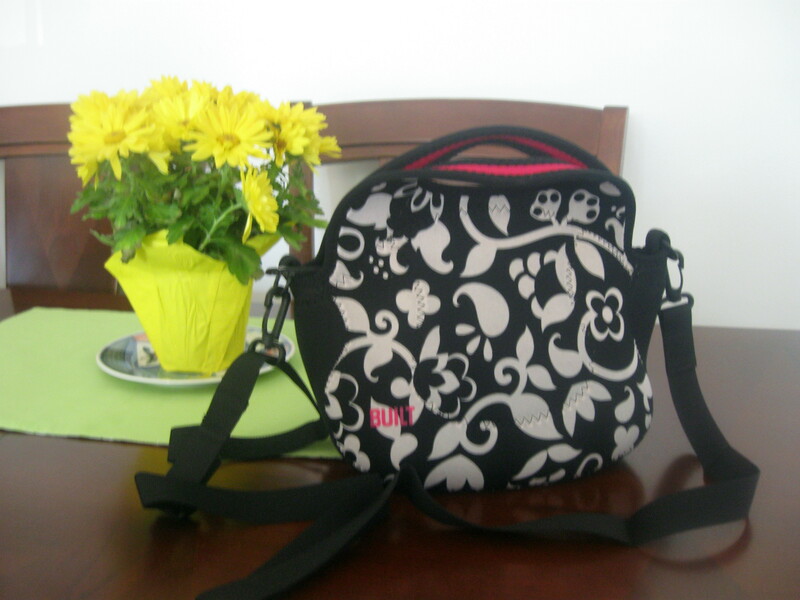 I blogged about my Built NY lunch bag right after I got it for Christmas in 2010. Since then, I have used it almost every weekday. It’s carried breakfast, lunch, and dinner (and a few times in grad school, all three!) It has ridden on trains, buses, and planes. There have been countless spills, and each time, it’s come out of the washing machine completely clean. I was a little bummed when the strap broke last week, but to be fair,the bag was (over) stuffed with a container of overnight oats, a container of chicken pot pie, a piece of fruit, and an ice pack. I emailed the company, thinking ‘it can never hurt to ask.’ They got back to me quickly, and said they’d check for a strap in the warehouse. When they found one, they immediately shipped it to me, free of charge. The bag is back in action! Now, onto the main dish. I was inspired by this chicken pot pie recipe from Eating Well, which features a biscuit topping. Like most aspects of life, I went ahead and made things a little more complicated. Note that this is NOT a weeknight dish. I had boiled the chicken the day before, and it still took well over an hour to prepare from start to finish. Then I had to let it cool before I could eat it. 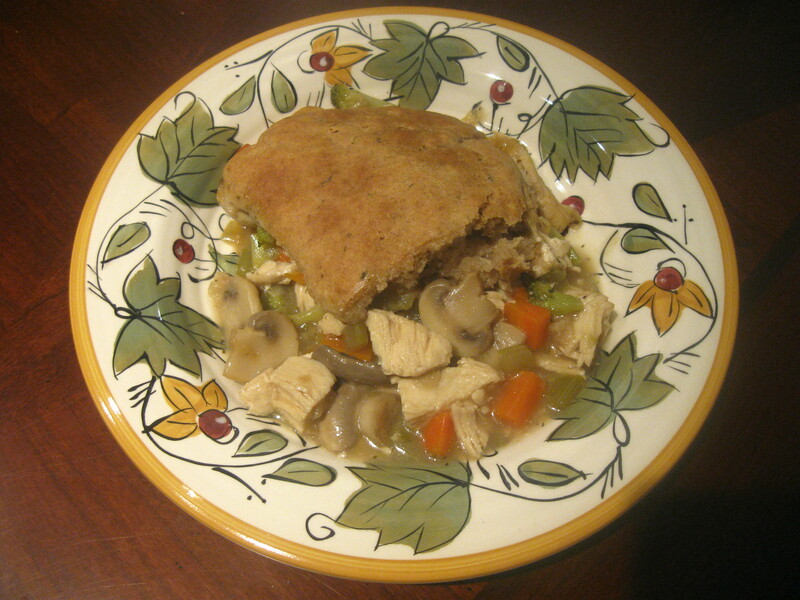 This is a great pot pie recipe though, and the leftovers were incredible. The filling was rich, and the biscuits were tender. You could easily adapt this further to whatever vegetables you have on hand, and you could expand the recipe to feed a larger crowd. Heat 2 t canola oil in a large frying pan. Add onion, celery, and carrots, and cook for 10-15 minutes, until just starting to brown. Add mushrooms, and cook for 10 minutes, or until the liquid is evaporated. Add 1 1/2 c. vegetable broth and bring to a simmer. Mix cornstarch into remaining vegetable broth, and add to pan. Cook for 5-10 minutes, until thickened. Add broccoli and chicken and stir well. Add yogurt, stir well, and remove from heat. Pour filling into a 2 qt baking dish. To prepare biscuits, whisk flours, baking powder, baking soda, and thyme. Using a pastry blender or two knives, cut in butter. Add buttermilk and 1 T oil, and stir just until moistened. Place large spoonfuls of biscuit dough on top of the filling. Bake at 400F for 30 minutes. Allow to cool before cutting. I went back to the basics this week and made a fairly standard chicken salad. I wasn’t going to blog about it, but it actually came out really good. Sometimes it’s nice to appreciate the simple recipes! 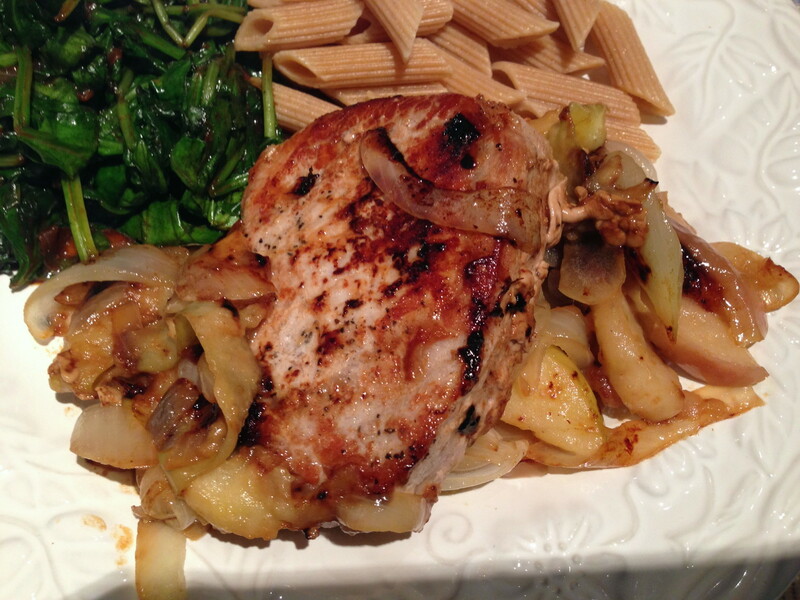 I had some boneless, skinless, chicken on hand, which I simmered on the stove until done. Then I let the chicken cool slightly, and shredded it with two forks. I stored it in the refrigerator, and used it for a few purposes. My favorite was this chicken salad, which I enjoyed on pita bread. I liked the combination of flavors and textures with the chicken, celery and raisins. There wasn’t a lot of mayonnaise, but just enough to hold it all together. If you’re going to take this as a packed lunch, I recommend you bring the chicken salad in a container, and stuff the pita right before serving. This keeps the pita nice and soft and makes a great sandwich! Mix all ingredients in a small bowl. Season with salt and pepper. My cooking club theme this month was “Things you Cook in a Muffin Tin”. I was really bummed that I had to cancel because of the storm. But since I was already in the muffin tin mindset, I went ahead and made these BBQ Chicken Meatloaves. I was inspired by this recipe from Rachel Ray, and my BBQ 3000 spice from Penzey’s. The spice contains salt, paprika, black pepper, nutmeg, mustard, allspice, garlic powder, ginger, sage, thyme, white pepper, cinnamon, and natural smoke flavor. I thought I was going to have to wait until summer grill season to try the BBQ 3000, but it worked perfectly here. The mini meatloaves came out great! They’re perfect to take for lunch, or heat up for a quick dinner. If you have little hands in your household, they would probably love to pick these up. The mini-meatloaves really do have a nice BBQ flavor. You could serve them as-is, or topped with spicy BBQ sauce for even more kick. I enjoyed mine with some homemade slaw – details tomorrow! Mix all ingredients in a large bowl. Shape into 12 balls, and place them into a muffin tin coated with cooking spray. Bake at 375F for 25-30 minutes, or until done.